Let us add the magic of music and sound effects to your project, no matter how small or large, from a 30-second commercial to a feature-length film. We work with our clients every step of the way to insure you are getting exactly what you want. deliverables, and deadlines. We will work from descriptions and/or examples you provide to insure accuracy and consistency. You will receive proofs for review (mp3 via email) at steps along the way to insure the project is proceeding according to plan. Final delivery via the media of your choice (file transfer over FTP or CD/DVD via snail mail). Tony Lechner has written music for short films and videos including the award-winning "Wings of EPOH". Whether you want a sweeping classical score, laid back jazz, or hard driving rock music, Wild-Wood Studio can bring your picture to life with just the right style and feel. Let's face it – without sound effects life can be pretty boring. Wild-Wood Studio provides top quality sound design for media of any kind, with meticulous attention to detail. Film, Interactive, Web, Television & Radio, all benefit from the addition of our award-winning sound design. Make your project come alive with sound! Wild-Wood Studio is equipped to record voice over for any situation, either in the studio or in the field. We'll handle all aspects of your project, from casting to coaching to recording to editing. With over thirteen years of experience teaching music, Tony has an uncanny ability to communicate, motivate, and bring out moving performances from the talent. Do you need an instrumental accompaniment track for your singers? Wild-Wood Studio has years of experience producing realistic backing tracks of the highest quality. Nothing you order from any publishing house can compare with the quality and faithful reproduction of sound you will receive from our custom treatment of your song. Plan on recording CD? Tony Lechner will produce your album here at Wild-Wood Studio or in the studio of your choice. Tony has 20 years of experience writing and arranging music, and can help with your arrangements and even co-write if desired. If you're looking for musicians to back you up, we'll work within your budget to find you the highest quality studio musicians. In two decades of performing and directing Tony has gained industry contacts all over the world, so on location recording is not an obstacle! Click to hear examples of Wild-Wood Studio's most recent production credits! High-quality audio field recording of your event or music performance. We offer two different price options for live recording for the budget-conscious. Choose between a simple, unobtrusive stereo recording from a small device or a more in-depth approach involving separate microphones positioned for maximum advantage of the sound source. Both techniques produce excellent, clean audio recordings. Finished project delivered on audio CD or DVD, or file transfer over FTP. Low resolution mp3's also provided if desired. Contact Tony Lechner for more information and free consultation. Let us add audio magic to your project! Click here for samples of recent work. – Peter H. Reynolds, Founder/CEO FableVision, Inc.
"Tony is a fabulous resource I return to again and again. 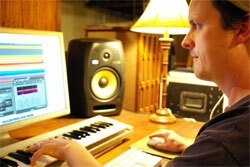 For both music composition and sound design, he always creates exceptional product that clients love. What more could you ask? I look forward to the next time we work together."